Finally, positive attention is being paid to the aging woman. Women in their 40s look better, feel better, have successful careers and seem to be able to do it all. In fact, it has been suggested that life for a woman really begins at age 40. For once, the "mature" woman is being celebrated rather than lamented. 40 is the new 30! In January 2016, the CDC released National Vital Statistics System data on U.S. Births from 2000-2014. In this report, a few important statistics stood out. First, the mean age of a woman having her first child rose to 26.3 in 2014 (up from 24.9 years in 2000). In addition, during this time period, first births to women aged 30-34 rose 28 percent and first births to women aged 35 and over rose 23 percent. Although the number of births to women after age 40 was unchanged from 2013, the birth rate for women aged 40-44 has consistently risen over the last 30 years. Finally, the number of births in women aged 45-49 increased by 3 percent in 2014. This report did acknowledge that delayed initial child-bearing in the U.S. has most definitely contributed to the increase in the mean age of a woman having her first child. The report also commented that an increase in "delayed initial childbearing can affect the number of children a typical woman will have in her lifetime, family size, and for the overall population change in the United States." Women are starting families later in life AND having more babies after age 35, that age that when a woman medically becomes "advanced maternal age", and even after age 40. 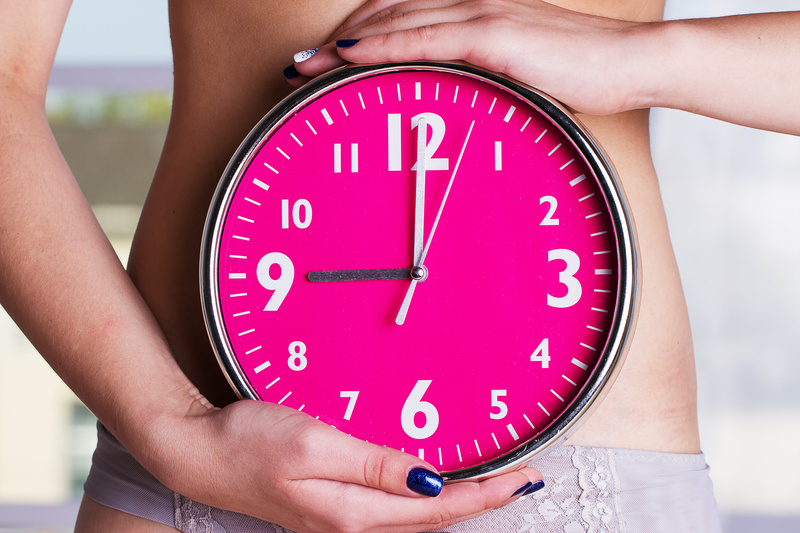 Because of this report, many social media sites and notable news outlets have even suggested that the biological clock is a thing of the past. A woman can wait until she is darn good and ready to have a baby. She can pursue her career or other life goals and have a family when she is "settled" at age 35 or older. So rest easy, "mature" woman. You CAN wait! A decision to delay child-bearing for ANY reason does NOT mean the ovary will delay the aging process. The fact remains that the internal biological clock continues to tick, i.e., the ovary marches on despite the fact that a woman has decided to wait. This means that women delaying child-bearing until their late 30s and 40s will still be faced with decreasing egg quantity (the number of eggs available for fertilization with each menstrual cycle) and egg quality (the number of available eggs that are genetically normal). In other words, having a baby may not be as easy as you or the media may think. To further put things in perspective, a woman is born with about 1 million eggs. By puberty 300 thousand remain, and a mere 300 are actually ovulated during her reproductive years--that's 1 per month over 25 years. In the American Society for Reproductive Technology (ASRM) document on age and fertility, it is noted that fertility starts to gradually decline after age 30 and especially after age 35. The average 30 year-old woman has a 20 percent chance of naturally getting pregnant each month if she is not on birth control. For a 40 year-old woman, the chance of getting pregnant each month decreases to 5 percent. Unfortunately, the ovary does not really care about your life plans and career goals. It's true. Women can and most certainly do naturally conceive in their 40s, but that doesn't guarantee you will. Many women delaying child-bearing are still faced with a diagnosis of infertility. For these women, that diagnosis may come as a surprise, especially after a lifetime of achieving their goals. The fact remains that advances in assisted reproductive technology (ART), or in vitro fertilization (IVF), are being utilized by and have allowed more women after age 40 to become pregnant. This includes pregnancies achieved with in vitro fertilization and the use of donor eggs and donor embryos. This also includes many celebrities who had babies well into their 40s. Many women often consider IVF a valid 'Plan B' if they anticipate waiting to have a baby in their late 30s and early 40s and are not able to conceive naturally. While the availability of these methods is allowing more women who have delayed child-bearing to have babies, it can be a very long, stressful and expensive option. More importantly, one can never assume that a pregnancy is guaranteed even with fertility treatments since the success rates of these treatments is also affected by a woman's age. Furthermore, in vitro fertilization and other fertility treatments do not always work. In this case, the option of donor egg, donor embryo and surrogacy are available, still making the possibility of having a child a possibility, but without having that genetic link and at a great financial cost. Forty isn't the new 30 when it comes to your ovaries, but that doesn't mean you need to have a baby before you are ready, with someone who isn't "the one", or while you are pursuing your career or life goals. It does mean, however, that you need to keep your ovaries in mind along the way. If you reach your early 30s and have no foreseeable plans of starting a family, see a fertility specialist who can test your ovarian reserve, the capacity of your ovaries to provide eggs that are capable of being fertilized, or consider fertility preservation through egg freezing. There are options. The fact remains that the ovary still calls the shots, and it is your job to listen.